Brioche is considered one of the most famous French bread. It is both light and sweet yet also incredibly rich in flavor which makes it one of most versatile bread and delicious with both savory foods and sweet. A Brioche dough is extremely workable, and not difficult to make though you may want to save this recipe for a Saturday morning or a long afternoon when you have extra time to commit to the soothing rhythm of kneading, chill, shape, rise, and finally, bake required to make the bread. The last step of eating is an exercise in self-control, as this brioche recipe smells incredible as it bakes and you will not want to wait. Once the bread has cooled to just warm enough, slice it and serve with butter. Put a special pot of preserves on the table, if you wish, but it really isn't needed; this brioche is an excellent stand-alone treat. Brioche is also delicious with Foie Gras. Using a stand mixer fitted with a dough hook, mix all the ingredients together on low speed for 10 minutes, until the dough is smooth and elastic. This process can take up to 15 minutes. Alternately, you can use a bread machine for the kneading portion of this recipe. Allow the machine to complete the dough cycle fully before moving on to the next step. Gather the dough into a ball place it in a large, greased bowl or dough container, turning once to coat the dough. Cover the bowl, and then allow the dough to rise for 45 minutes at room temperature. 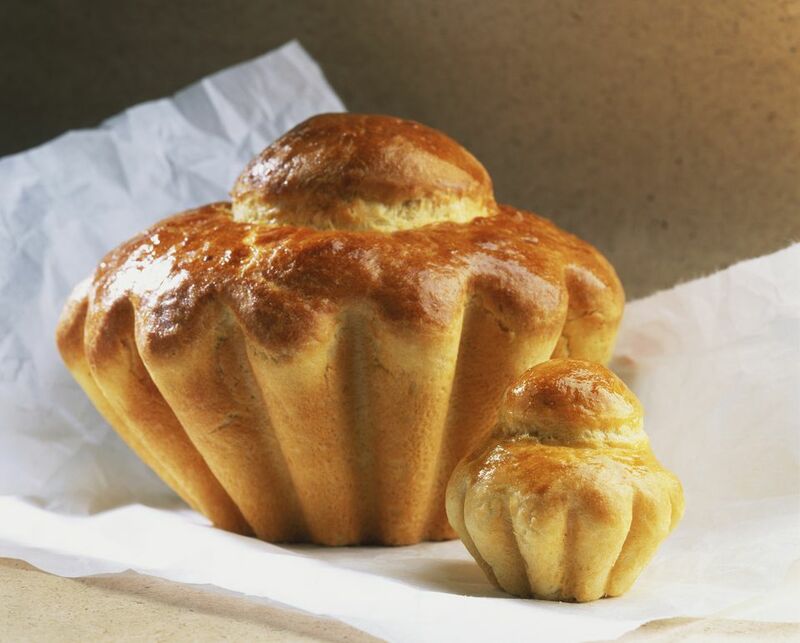 ; this will kick-start the fermenting process to give the brioche its signature flavor. Refrigerate the dough for at least 8 hours, or overnight. Do not allow the dough to rise for more than 12 hours. Place the risen dough in a greased brioche pan, loosely cover it with lightly greased plastic wrap, and then allow it to rise for 90 minutes to 2 hours until it has doubled in size. Brush the dough with the reserved egg white. Preheat the oven to 400F. Bake the brioche for 10 minutes. Without opening the oven, reduce the heat to 350F, and continue baking the bread for an additional 30 minutes. The bread is done when a digital thermometer reads 190F. If the bread begins to brown too fast, before it tests done, cover it with foil to avoid burning the brioche. Alternately, bake the bread in 12 muffin tins for 20 to 25 minutes, until they test done. Allow the large brioche to cool in the pan for 10 minutes or the individual rolls for 5 minutes, and then transfer the bread to a wire rack to cool. For the best flavor and texture, serve it slightly warm or at room temperature on the first day. Use any day-old brioche in our luscious brioche bread pudding recipe.